I have a deep and abiding love of Mexican food, and one of those loves is Ranchero Sauce. Ranchero is a “garden” sauce of tomatoes, peppers and seasonings, easy to make and so versatile. It can be used in so many ways, it should be one of those “back pocket” recipes everyone (imho) should know. My love of Mexican food didn’t have very auspicious beginnings! It all started with the Taco House, a little shack of a hut in an area referred to as the “Iowa Great Lakes.” Back in those days the Taco House had a dirt parking lot, a sliding window (complete with bug lights) and you’d stand outside, order, get your tacos and eat at one of the picnic tables. The Taco House has grown up & now, changed hands (and has very mixed reviews) but is still an institution in Arnold’s Park. Those in the know, by the way, stick with tacos and use the salsa liberally! In the meantime, I’ve grown up, too, and so have my tastes! My next introduction to Mexican food came with a move to Colorado, where I was introduced to the many sauces, salsas and dishes of Mexican food. That’s where I learned about Ranchero Sauce. It’s the same signature flavor you’ll find in my Aji Salsa. It’s a marvelous combination, and that sweet/sour flavor is found not just in Mexican food, but food throughout Latin America. I have a few recipes that use Ranchero: these Classic Enchiladas and Chile Rellanos, but this is the recipe I use when I want to serve Huevos Rancheros, Eggs in Ranchero Sauce, omelettes, or scrambled eggs. Its great in my Three Cheese Enchiladas with Braised (or pulled) Pork, too. You can modify this as you wish. Make it hot or as mild, use fresh or canned tomatoes, peppers of your choice. The vegetables can be finely chopped or left chunky or the whole sauce can be blended to a smooth texture. Although Ranchero Sauce doesn’t take long to make, it does freeze very well and it’s nice to have some on hand to heat up when you need to fancy up a breakfast and don’t want to go to a lot of effort. Yeah, raise your hand if you’re with me on that one! #Not a morning person! 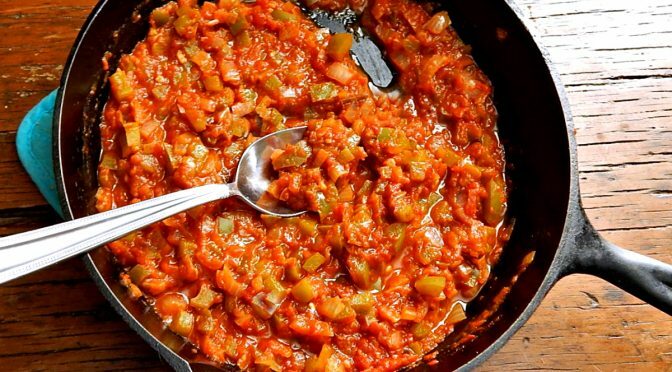 A garden tomato based sauce with tomatoes, onions & peppers. 1 29 ounce can of whole tomatoes & juice, tomatoes pulsed in a blender or crushed by hand. Fire roasted tomatoes, if you’d like. See note. Heat olive oil in a medium saucepan, add onion and peppers and cook until slightly softened. Add garlic, cumin and cayenne and cook for just a minute longer. Add tomatoes and juice and simmer until vegetables are cooked through and softened and sauce is thickened, about 15 minutes. When a spoon is run through the sauce it should not immediately fill in. Add the sugar, salt to taste and vinegar and cook for a minute or two longer to blend the flavors. Feel free to increase/decrease the amounts of sugar, salt, Jalapeno or Serrano, cayenne, vinegar, etc. to suit your taste. Notes: to prepare the jalapeno or serrano, char over a gas burner or put on a piece of foil on a sheet tray and broil, turning as needed until charred. When finished, put in a small bowl and cover for several minutes. Remove the charred coating. Tomatoes: In the summer, I often use fresh tomatoes, about 2 pounds, peeled & seeded, with their juice. This entry was posted in Click here for Fabulous Food Posts and tagged Bell Peppers, Condiments, Freezes Well, Frugal Hausfrau, Hot Peppers, Mexican or Southwestern, Ranchero Sauce, Tomatoes, Vinegar. Bookmark the permalink. Oh, yes, this is a fave, Elaine!! I love it with scrambled eggs!